Our principle location is in Cushing, Maine. a small town on the Atlantic coast about 75 miles east of Portland and near Rockland. 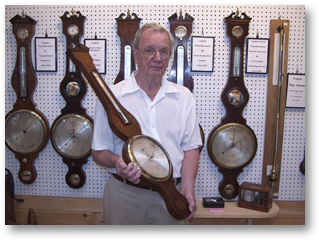 In Cushing we maintain a gallery to display our stock of antique barometers. After 35 years in the antiques business in suburban Philadelphia, where we sold and repaired barometers under the name "Neville Antiques," in 1986 we relocated to Maine. We have several other locations which are detailed on our Display Locations page. When we undertake to restore an antique barometer we try to make it look and work as it did when it was new. However we do try to retain the original surface if possible to save the patina that instruments acquire over the years. All of our replacement parts, from glass to brass or wood and ivory, are hand made by craftsmen in their respective trades. We prepare appraisals of barometers, for one piece or for a collection. Appraisals are typically made for estate or insurance purposes, and are based upon current market conditions and location. We live at the shop location and are open if we are home. It is best to call ahead when you come to visit. We can be reached by phone by day or evening. We can often give estimates over the phone. We have a hand delivery service to most of New England and south to New York city. Call for other areas.